The Half Moon originally built as a dwellinghouse in 1755/59, was converted into an Inn circa the late 1700’s. 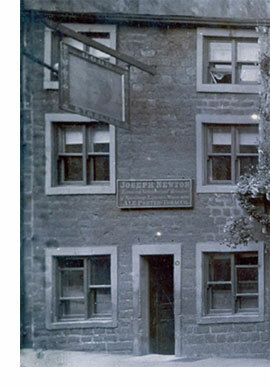 In 1920, Edward Deighton Barret sold the hotel, together with the Royal White Horse, to Joshua Tetley & Sons. An application was made in 1954 by David Stuart McBay, for a transfer of the Licence of the Half Moon Hotel, Otley, from George Edward Burrell. Mr. Burrell no longer lived at the hotel and his wife wished to be relieved of the management. A Protection Order was granted to Mr. McBay. Regrettably, the pub closed in 1971 when it went on the market in June of that year with vacant possession. The building is now occupied by The Wharfedale Practice who opened late August/early September 2012 and by Otley Word Feast Press .